If chemotherapy is being considered as a treatment, it is desirable to know which of the chemotherapy drugs will have a high probability of being effective against YOUR particular cancer, before any toxic agents are administered to your body. It is equally important to know if your particular cancer cells exhibit extreme drug resistance (EDR) to specific chemotherapy drugs. At present, most cancer chemotherapies are prescribed by medical oncologists, according to fixed schedules. These standard protocols and schedules are developed following lengthy and expensive Phase II and Phase III clinical trials. After so much time and money has been dedicated to this research, many patients and physicians believe that the recommended protocols are the best treatment. Regrettably, average treatments provide average outcomes, with the majority of patients failing to show improvement from these protocols. Cancer is an individual disease, as unique as the person fighting it. However, there is another option. There are several companies that perform chemo-sensitivity and resistance tests on specimens of your cancer to determine the optimal chemotherapy drugs for YOU. Chemo-sensitivity testing provides custom-tailored assay-directed therapy based on YOUR own tumor response in the laboratory. 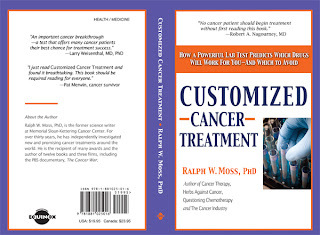 This eliminates much of the guess work prior to you undergoing the potentially toxic side effects of chemotherapy that could prove to be of little use to YOU. At the time of biopsy or surgery, a sample of tumor tissue (or blood sample in the case of non-solid tumors) is sent to a laboratory and they test a number of chemotherapy drugs on the sample, including combinations of drugs. If your oncologist wants to suggest a drug, that is fine and they will include it. Typically in 3 - 5 days, you will get results of which drugs your cancer cells show most sensitivity to, and which drugs they show resistance to. This kind of testing can be useful at the time of initial therapy, and in the case of severe drug hypersensitivity, failed therapy, recurrent disease and metastatic disease, by providing assistance in selecting optimal chemotherapy regimens. Today chemosensitivity testing has progressed to the point where it is 85 - 90% effective. So why isn't chemo-sensitivity testing used routinely? How come it is so rarely mentioned? One reason relates to an older methodology to test sensitivity that was used in the 80's where tumor cells were cloned. This method did not yield useful results and was unreliable. As a result of several influential editorials and articles in the 80's, all such testing was shunned because of this one unreliable technique. This method subsequently disappeared but seems to have tarnished the very idea of sensitivity testing, despite the current methods using totally different techniques. Physicians and oncologists are not aware of the current reliable methods and when they hear about sensitivity testing, assume it is the old unreliable methods. 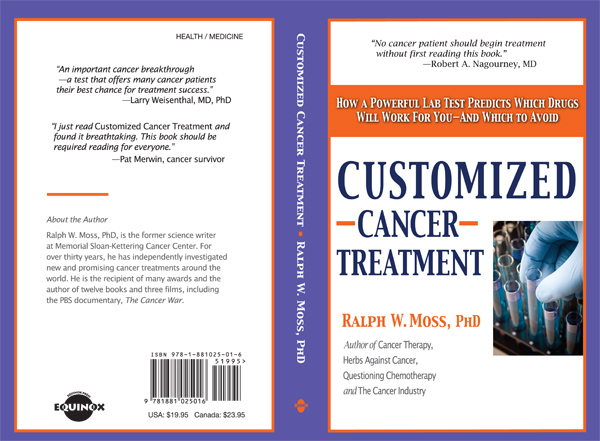 If you want to know more, read Ralph Moss' book "Customized Cancer Treatment" which is all about chemo-sensitivity testing - and better yet - buy a copy for your oncologist! The best known of these are Rational, Weisenthal and DiaTech. Currently, most insurance companies will not cover the cost of this testing. Check out the websites for published research and more information.